One of the primary conceits of Scooby-Doo is that there is a mundane explanation for all of the weird stuff that happens in their world. Carl Sagan praised this aspect of the show, lamenting how other shows glorified supernatural explanations. He liked how, in Scooby-Doo, “paranormal claims are systematically investigated and every case is found to be explicable in prosaic terms” (from his book The Demon Haunted World). But, what if, at least once, the paranormal turned out to be real? That is the premise of Meddling Kids, by Edgar Cantero. A gang of kids spent their summer vacations in the coastal area of Oregon and stumbled on to some weird goings-on. They ultimately find that it was a man in a costume who was trying to scare people to get access to some ancient fortune. The kids — dubbed the Blyton Summer Detective Club — are heroes. But, it turns out, they also uncovered an ancient and real evil. Now adults, they are haunted by the glimpses of that evil they saw as kids. They decide to confront it. The gang — Kerri, Andy, Nate and Tim, versions of Daphne, Velma, Shaggy and Scooby (I won’t say why Fred isn’t here) — head back to Oregon to figure it out. I won’t give too much away, but I will say that while Cantero violates the idea of Scooby-Doo that Sagan liked so much — that there is a “prosaic” explanation for all strange phenomenon — he still does manage to give a scientific basis for a lot of what goes on. For example, the kids are wandering in a mine and Nate, the Shaggy fill-in, asks how the miners knew where to dig to find gold. Kerri (who is a bookish Daphne) explains that the miners followed a quartz reef as gold was often found inside quartz veins. Later, in reference to how an earthquake can cause a pressurized lake to essentially explode, Kerri describes a limnic eruption. This happens when a body of water full of pressurized carbon dioxide becomes agitated, perhaps via an earthquake or tremor, violently releasing the CO2 as a deadly cloud of gas. So, Cantero, in creating the mystery the kids must solve, has still used science to an extensive and creative degree. While the core of the mystery still has elements of the supernatural, the rest of it is based on science in a way that I think does service to the ideas of Scooby-Doo. So, I learned something new reading this book. I also found it very entertaining. The characters aren’t simple mash-ups of the Scooby characters, they have their own traits and flaws that make them unique. The plot is engaging and the quick pace almost feels like a movie. And, ultimately, there are enough twists and turns to keep it fresh. 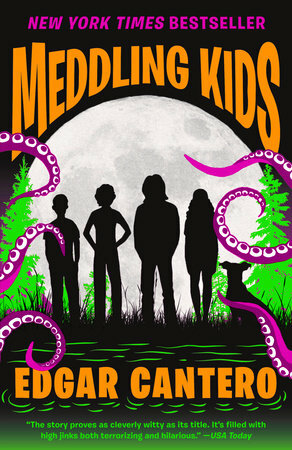 I enjoyed Meddling Kids and will be looking for more from Cantero.